I have been busy making some new teacup candles, which I have began uploading into my Felt store today. I'm hoping to get some more up in the next few days. 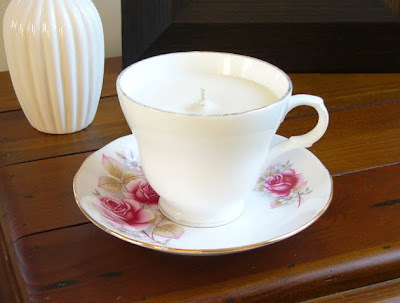 Mother's day is gettting closer, and if you're still deciding what to get her, a teacup candle might be just the ticket. Of course if you have children, you might want to start dropping some subtle hints! Mothers do so much for us, so it's nice to say thank you now and then. My mother shared her love of crafting with me, something I'll always be grateful for. Mother's day is on the 8th May, so there is still time left to get orders in the post. Last week I was privileged enough to be featured in Mel from Wildflower's "Have you seen this" feature, where she interviews a crafter that has caught her eye. You can read the post here. I hope you all had a nice break over the long weekend. We went to Nelson to visit my family, and were lucky enough the experience the fringes of a 4.3 earthquake near French Pass. I swear they must be following me around, when we got home on Sunday we were greeted by another 4.3.